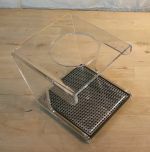 The Pour-Over Expert Kit is a stunning coffee-making set for grinding and brewing drip-filter coffee with precision! 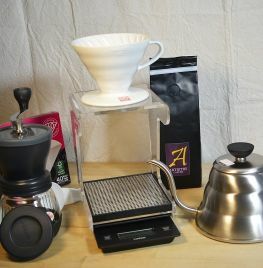 The kit includes a Ceramic V60 02 Dripper, Hario Skerton Grinder, a Drip Stand, and Drip Scales for precision, also filters and of course some beans to get started. Plus the elegant Buono Pouring Kettle. 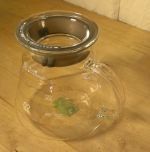 Perfect for someone who knows the hand-brew techniques and wants to precisely control their pour-over coffee making - and wants it all to look good too! with gooseneck pouring spout for accurate coffee pouring. 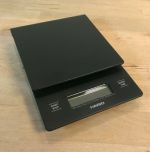 The Hario scales are accurate to 0.1g and slot directly under the Hario Drip Stand as they are designed to be used together. Roasted by Redemption Roasters and sourced from Rosa Abad's farm at 1700+meters on the Rancho Carmen mountain range in Ecuador. Suited to pour-over coffee making.